It seems to me that no files have been created in MiKTeX. Hence I have recopied manually the files to the appropriate directories as README. "Compiling a document that uses pythontex involves three steps: run LATEX, run pythontex.py, and finally run LATEX again". And the .pdf file obtained from the tex file (after several latex compilation) looks like this: ?? 1) I am not able to process the second step. How do I activate pythontex.py on a .tex file from TeXnicCenter? 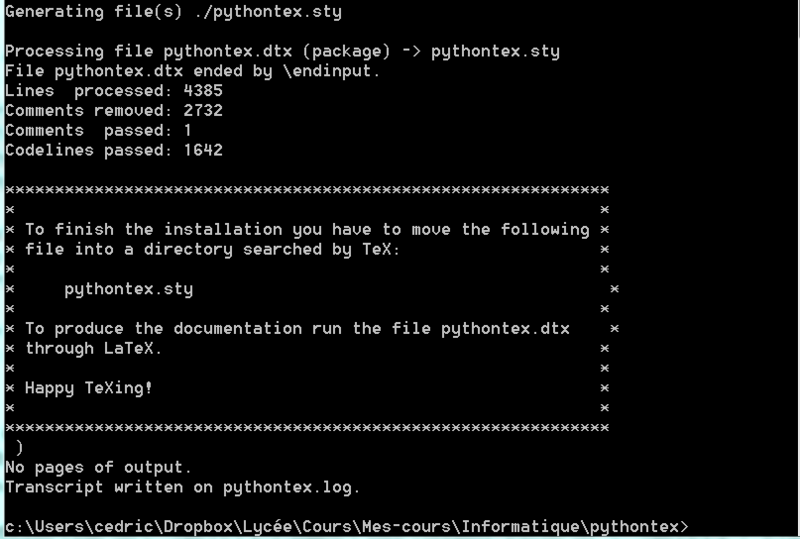 My feeling is that my system does not recognise pythontex.py: there is a problem in my installation of pythontex. Browse other questions tagged compiling texniccenter python pythontex or ask your own question. Beamer not working at all! Pythontex don't work ? why?